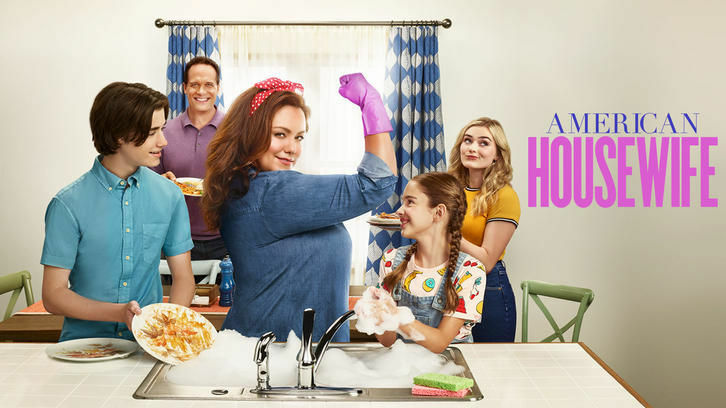 American Housewife - Liar Liar, Room on Fire - Review: "Earthquakes or Raptures or AI Singularities"
There's a birthday in the family this week. It's gonna be quite a memorable one. It's Greg's birthday and the kids present him with a slew of presents all cashing in under one dollar (a creepy card - Anna Kat, a coupon for a clean room - Taylor, and 99 shares of penny stock - Oliver). When the kids notice Katie doesn't have anything for him, they accuse her of forgetting. She insists she does have a present, Greg's just got to wait until that evening. (Of course, she's lying!) 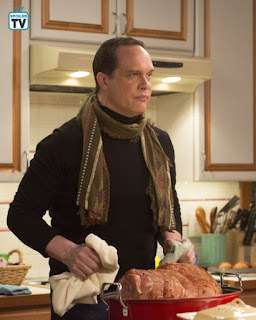 Greg assumes she's finally throwing him a fancy dinner "salon" that he's been asking for for years, where people "discuss art and wear scarves indoors." Doris and Richard, and Angela and her new girlfriend Chrissy, a therapist, arrive for the world's most awkward dinner "salon." It doesn't take long before the group catches Greg lifting a heavy pot of chicken out of the oven and the hernia surgery's cover is blown. But, instead of just coming clean to Doris that she hates her dinner parties, Katie decides to take the lie a step further and tells everyone that they couldn't make dinner last week because they were in marriage counseling. Greg's less than thrilled about this lie, but Katie insists he play along. Unfortunately, he plays along a little too well when Angela and Doris not-so-jokingly imply that marriage counseling is Katie's fault. Katie's ready to fess up at this point, but Greg insists they'll just look crazy if they finally tell the truth now (plus he's starting to have some serious fun playing the trampled on husband), so Katie hesitantly agrees to try and carry on the lie for the rest of the night. While the adults are downstairs, the kids face their own set of problems. Taylor sets Anna-Kat aka "OCD girl" to work cleaning her room. While going through her dump truck of a room, the kids throw one of Taylor's shirts on the lamp and it catches fire. They're able to put the fire out, but they realize they're going to have to cover up the singed wall if they have any hope of Katie not biting their heads off. Oliver retrieves paint, but the screwdriver's downstairs and again, there's the whole "visible blood" thing, so they try to open the paint jar with a hilarious sequence of items - pencils, toy horses, and finally (successfully) keys. But then Oliver accidentally kicks the paint can over. Back at square one. The kids then try to scrub the paint off the floor but Oliver and Taylor end up arguing and flicking paint at each other. Sounds harmless, right? Not so much. In trying to get away from Taylor, Oliver backs into a dresser which tips over and puts a hole in the wall! Downstairs, the night finally comes to a dramatic ending, when Katie, sick of being blamed for their "marriage problems" spills the beans. Doris and Angela find out that she has regularly lied to both of them to get out of activities she has no interest in. Of course, this is enough for Doris and Angela to let Greg in on a big secret - that the dinner party is a last-minute cover up for Katie forgetting his birthday! 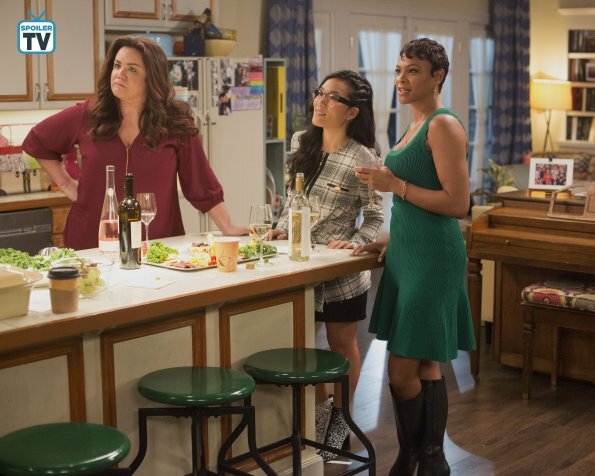 The next day, Greg meets up with Doris and Angela for "second breakfast," where they decide something has to be done about Katie's constant lying. Pulling in Chrissy, they stage an intervention. When Katie is ambushed, Chrissy gets her to admit some of her more numerous lies, before questioning why someone who has such an easy time being blunt to strangers can't tell the truth to her loved ones. Katie finally admits the lies are because of exactly that - she cares about them all so much she doesn't want to hurt them with the sometimes harsh truth. Katie tells them all how much they mean to her, and apologizes to Greg for forgetting his birthday. And now that she's practicing being honest - she even drops a bomb on Chrissy - Angela's more than likely going to cheat on her so she better run while she can! While Katie's being "intervened," the kids rearrange the furniture in Taylor's room to hide all the damage. When they show off her newly cleaned room to Katie and Greg later, both are none the wiser. The three agree to keep the truth about what really happened in that room a secret until they've all moved out! Later at the house, Katie presents Greg with a coupon for a real dinner "salon," with all his intellectual friends. Greg admits that he's also realized something - some of Katie white lies to spare his feeling have probably been for the best. In the final scene, the show flashes forward 10 years. Taylor's (finally!) left the house, and an older Katie and Greg are cleaning out her room, when they find all the damage, accompanied by a 10-year-old from the three kids - "Dear Mom and Dad, by the time you read this, the statue of limitations will have run out!" With the newly discovered damaged to the house, Katie announces that she guesses they can't have Greg's salon that night. Yeah, they still haven't had that! -After hearing Richard's "edge of your seat" storytelling, I kind of wish he's stayed hiding in the bathroom all night! -Greg, I love Anne Sexton, but one of her poems was definitely not going to diffuse your train-wreck of a dinner party! -Best lines go to Doris - "Oh my gosh. I'm so sorry. No Habla coo-coo!" -Do you think Katie will cut down on the lying? Let me know below!